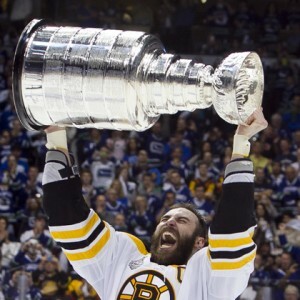 B’s Captain, Zdeno Chara is the first Bruin to Lift the Stanley Cup in almost 40 years. As Cup Champions at last, the Boston Bruins are on top of the world. They emphatically deserve the title of victors, the best team in the land, but arguably not the most talented. The B’s were overstated as underdogs in skill by many who cover the game, but they played with the hearts of lions and were rewarded with Lord Stanley’s Cup. Considered by many to be a team whose talent level was underwhelming at the best, and certainly not the equal of the Western Conference Champion Canucks, the Bruins raised the Cup Wednesday night in Vancouver. With no players in the top-35 regular season scorers, and team speed that could best be described as “mediocre”, experts around the league found it hard to believe that this squad could compete at the highest levels. In recent years, Stanley Cup Champions had pinnacle skill guys like Marian Hossa, Jonathan Toews and Patrick Kane with Chicago in ’10; Sidney Crosby and Evgeni Malkin with Pittsburgh in ’09, Pavel Datsyuk, Henrik Zetterberg, and Nicklas Lidstrom with Detroit in ’08. In fact, no team has won the Cup since the lockout (till the Bruins) with fewer than two top-35 scorers. Each Cup-winner since the lockout has had a player in the top-ten in league scoring, save for Anaheim in ’07, which had Teemu Selanne sitting just outside at 11th. The Bruins top scorers were Milan Lucic and David Krejci, whose 62 points each were good for a tie for 39th in the NHL. The B’s did have several sterling postseason performances, including Krejci’s playoff-leading 12 goals and 23 points. One can understand the reticence of many to label the B’s as prime Cup contenders. Their perceived talent gap when facing three of the top seven offenses (Philly, Tampa and Vancouver) is well documented. However, the pundits and experts failed to account for the magnificent heart and indomitable drive of the Bruins. It takes considerable effort and will to come back from 2-0 deficits in two challenging series, to face elimination in three game sevens and win them all, to overcome the losses of Patrice Bergeron and Nathan Horton, and to silence the myriad critics and skeptics throughout the season. Analysts like Pierre LeBrun of ESPN didn’t see how the B’s could thwart the vaunted Sedins: “They [the Sedins] will continue to light it up, just as they did in the Western Conference finals against the San Jose Sharks.” However the apparently underrated pairing of Zdeno Chara and Dennis Seidenberg were able to effectively silence the Swedish Wonder Twins, holding them to two goals and five points in the seven game series. 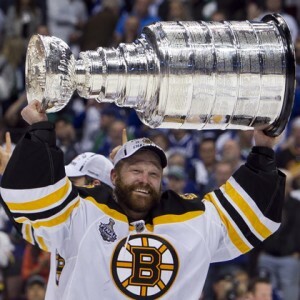 The sterling play of Tim Thomas was without question a major (if not the foremost) factor in the B’s drive to the Cup. While many understood his remarkable abilities, few believed that his unorthodox style and scrambly antics could possibly hold up over the course of a long postseason. His 1.98 GAA and .940 save percentage in the 2011 playoffs speak to his stellar play…but the fact that he had the Conn Smythe essentially won with three games remaining evinces his truly dominating performance. Several pundits around the hockey world predicted the edge between goaltenders would be significantly narrower than it was; The Hockey News seemingly inexplicably gave the advantage in net to Vancouver in their Cup Finals preview, an almost laughable supposition after the fact. In the Finals and throughout the playoffs, the Bruins epitomized the phrase: “The whole is greater than the sum of its parts.” A combination of defensive skill, brilliant goaltending and team-wide determination was enough to quiet the doubters and bring home the championship. The Cup is back in Boston, because of a team whose resolute will was just too much for an eminently talented Vancouver club. Should the Oilers Consider Kris Letang?